DETAILS: The case is personalized and it acts as a great, lightweight, transportation for your spatula, fork, and tongs. 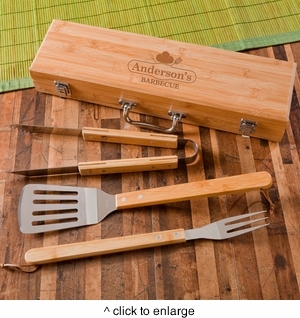 The set is made out of high-quality bamboo and the case is equipped with securing latches and a rugged handle. MARKETING: Men, Groomsmen, Father's Day, Dad Gifts!